David Livingstone arrived in Africa in 1840 with two goals: to explore the continent and to end the slave trade (see Livingstone Discovers Victoria Falls, 1855). In England, his writings and lectures ignited the public's imagination regarding the "Dark Continent" and elevated Livingstone to the status of a national hero. In 1864 Livingstone returned to Africa and mounted an expedition through the central portion of the continent with the objective of discovering the source of the Nile River. As months stretched into years, little was heard from the explorer. Rumors spread that Livingstone was being held captive or was lost or dead. Newspapers headlined the question "Where is Livingstone?" while the public clamored for information on the whereabouts of their national hero. By 1871, the ruckus had crossed to the shores of America and inspired George Bennett, publisher of the New York Herald, to commission newspaper reporter Henry Stanley to find Livingstone. 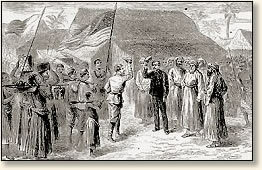 Leading an expedition of approximately 200 men, Stanley headed into the interior from the eastern shore of Africa on March 21, 1871. 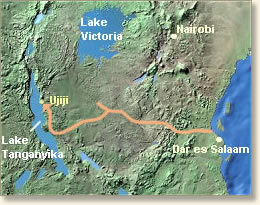 After nearly eight months he found Livingstone in Ujiji, a small village on the shore of Lake Tanganyika on November 10, 1871. "We push on rapidly. We halt at a little brook, then ascend the long slope of a naked ridge, the very last of the myriads we have crossed. We arrive at the summit, travel across, and arrive at its western rim, and Ujiji is below us, embowered in the palms, only five hundred yards from us! At this grand moment we do not think of the hundreds of miles we have marched, of the hundreds of hills that we have ascended and descended, of the many forests we have traversed, of the jungles and thickets that annoyed us, of the fervid salt plains that blistered our feet, of the hot suns that scorched us, nor the dangers and difficulties now happily surmounted. Our hearts and our feelings are with our eyes, as we peer into the palms and try to make out in which hut or house lives the white man with the gray beard we heard about on the Malagarazi. 'I am Susi, the servant of Dr. Livingstone,' said he, smiling, and showing a gleaming row of teeth. In the meantime the head of the expedition had halted, and Selim said to me: 'I see the Doctor, Sir. Oh, what an old man! He has got a white beard.' My heart beats fast, but I must not let my face betray my emotions, lest it shall detract from the dignity of a white man appearing under such extraordinary circumstances. 'Yes,' said he, with a kind smile, lifting his cap slightly. Then, oblivious of the crowds, oblivious of the men who shared with me my dangers, we - Livingstone and I - turn our faces towards his tembe. He points to the veranda or, rather, mud platform, under the broad overhanging eaves; he points to his own particular seat, which I see his age and experience in Africa has suggested, namely, a straw mat, with a goatskin over it, and another skin nailed against the wall to protect his back from contact with the cold mud. I protest against taking this seat, which so much more befits him than me, but the Doctor will not yield: I must take it. . . . I called 'Kaif-Halek,' or 'How-do-ye-do,' and introduced him to Dr. Livingstone, that he might deliver in person to his master the letter bag he had been intrusted with. This was that famous letter bag marked 'November 1, 1870,' which was now delivered into the Doctor's hand 365 days after it left Zanzibar! How long, I wonder, had it remained at Unyanyembe had I not been dispatched into Central Africa in search of the great traveler? The Doctor kept the letter bag on his knees, then presently opened it, looked at the letters contained there, and read one or two of his children's letters, his face in the meantime lighting up. 'Ah,' said he, 'I have waited years for letters, and I have been taught patience. I can surely afford to wait a few hours longer. No, tell me the general news. How is the world getting along?' "
Farwell, Byron, The Man Who Presumed; a Biography of Henry M. Stanley (1957); Stanley, Henry, How I Found Livingstone (1872). 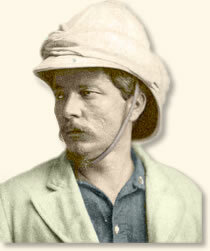 "Stanley Finds Livingstone, 1871", EyeWitness to History, www.eyewitnesstohistory.com (2004). Stanley's expedition had suffered through over 6 1/2 months of drought, famine, floods, dysentery and starvation before it reached Ujiji. Two-thirds of the original number of porters had deserted or died. David Livingstone died a few months after his encounter with Stanley on April 30, 1872.